The city of Oxford has not seen significant growth in recycling over the past two decades, despite Miami University initiatives to get students to recycle more, both on and off campus. In 2013, Miami University established an “All Together” recycling initiative, mainly aimed at on-campus students. In January 2017, the university’s web site told students to “recycle this, trash that” based on a recycling quiz that proved most students held “common misunderstandings” about recyclables. The university also has a page for off-campus recycling, complete with a one-minute video on how to properly recycle food containers and plastic bags. But recycling in Oxford has not changed much since 1999 when Oxford recycled 16.45 percent of its curbside waste, including drop-off recycling. In 2017, almost two decades later, the yearly percentage was 17.67 percent, according to the City of Oxford’s annual quarterly reports. The most recent national data was collected in 2015, in which the national recycling rate was 25.8 percent. “Recycling is an important piece of our business,” said Molly Yeager, Rumpke representative. How important? Off-campus students in Oxford are saying that their recycling bins are not being regularly collected. Senior Madeline Niceswanger said that her recycling is only picked up every other week, as opposed to weekly pick-ups with her trash. “Our recycling definitely accumulates over two weeks and there have been several instances where it’s gotten a little out of hand volume-wise,” she said via Facebook. 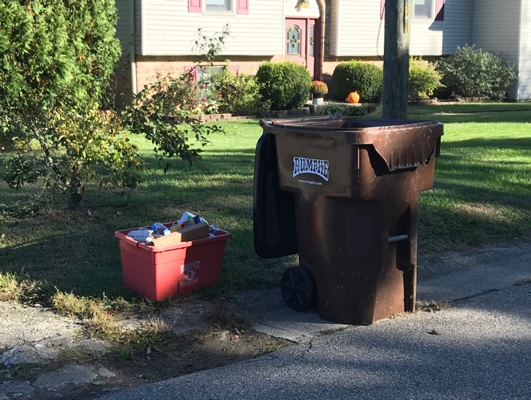 Yeager insists that it is best to put out your trash and recycling bins the night before pick-up, and not the morning of, to avoid this issue; but Niceswanger said that she does put out her trash and recycling the night before pick-up and still finds her recycling left in the bin after pick-up day. There is also a common issue of bins being stolen or misplaced among off-campus students. Alexx Apicella lives in a rental home on West Vine and claims that her recycling bin has been stolen up to six times, with multiple weeks passing before each stolen bin was replaced. Oxford environmental specialist David Treleaven said that if a resident needs a bin, all they have to do is call the utility at 513-524-5222. “I haven’t heard about it and I have a stockpile of them downstairs, so if they were to call utility building and request we can get them there probably the next day or within the week,” said Treleaven. Treleaven said this only applies to single-family homes and rentals, but not apartment complexes. Even worse, other students have said that both their recycling and trash are being put into the same truck, which would defeat the purpose of the recycling initiatives entirely. Rumpke denies that this could be true, claiming that the drivers would have no motivation to do such a thing. Yeager said that most complaints have to do with the misunderstanding of the recycling pick-up system. Yeager also said that Rumpke takes such mix-ups very seriously, and that anyone who sees something suspicious should report it right away so that Rumpke can do a full investigation. Anne Fiehrer Flaig, district coordinator for Butler County Recycling & Solid Waste District, said that it is the responsibility of the city to ensure proper recycling and trash pick up. After all, it is the city who owns the contract with Rumpke and is coordinating payment for the service. Currently, residential curbside recycling collection costs $3.63 per month, which includes the red recycling bin. There are also larger green recycling bins that can be had for an additional $1 per month. But this might not be the best fee structure to encourage people to trash less and recycle more, said Lisa A. Skumatz, chair of the National Recycling Coalition. For now, Oxford’s recycling mysteries are stuck in years of no progress. On Linwood Lane, residents noticed that all but one household was successful in recycling pick-up Monday morning. The residents who did not have their recycling taken had put out their bin the night before. Even so, there is a chance that their recycling might have not been recycled. Yeager said that that Rumpke has a 13 percent contamination rate, which drivers attempt to reduce at the curb. Could this be the reason for confusion among students? Perhaps. But it still doesn’t explain the stealing of bins or the weeks waiting for new ones. Rumpke claims that at least half of the things we throw away each day could be reused or recycled. But once those materials are on the curb, they’re in the hands of Rumpke. In 2015, the United States recycled 25.8 percent of its total waste, according to data provided by the EPA. The state of Ohio had a residential/commercial recycling rate of 27.3 percent for the same year. The City of Oxford, comparatively, came out significantly lower than these state and national averages in the year 2015 with 18.59 percent of its waste going to recycling. 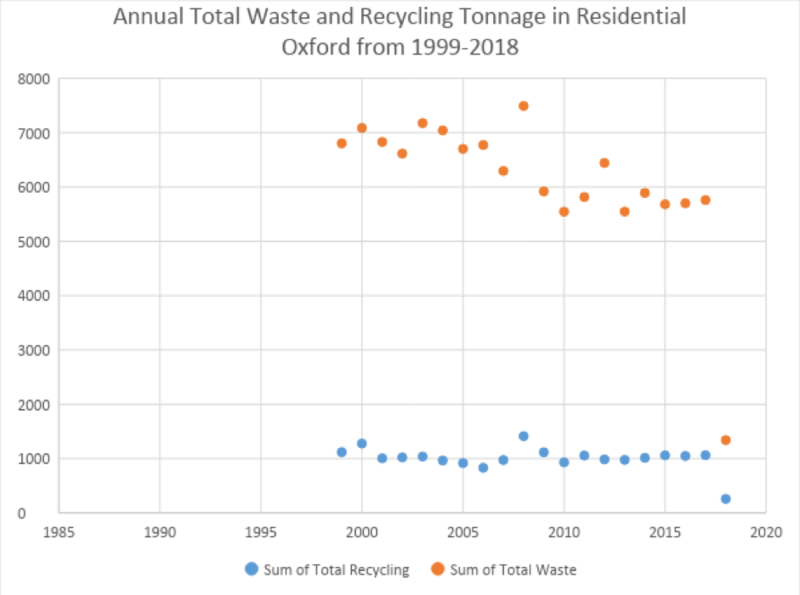 Trash tonnages have gone down in the past two decades, but recycling has stayed the same, which can be seen in the stagnant recycling percentages for the city of Oxford. The 2018 data is incomplete, which can be seen by the sudden drop at the end of the chart.